Since childhood, I have loved Thanksgiving more than any other holiday. An occasion of pure joy, happiness and love, my entire family would gather at my Grandmother’s house. From cooking together, laughing together, and finally sitting down to eat the delicious turkey, stuffing and pumpkin pie; it was and still is one of our favorite times of the year. As amazing as my thanksgivings always were and continue to be; it is only when I got older that I was able to truly appreciate what made the day so wonderful. The ability to “give thanks” to our creator for the bounty he has blessed both my life and the lives of my family members with, is humbling. And for me, a holiday that is centered around loved ones while eating delicious food, and taking a moment to thank God, is about ‘as good as it gets’ in life! We all know that Thanksgiving can turn into a bit of a gluttonous affair, so I want to encourage all of you to enjoy, but eat carefully while spending this special time with your family and friends. As you know, right now I am on a strict regimen of lifting weights and cardio, eating only certain foods to drop weight and build muscle. And while it has not been easy, it is about to get even harder because I will not be giving myself a pass on Thanksgiving. So come Thursday, I will be limiting all sugar, breads and gluten. 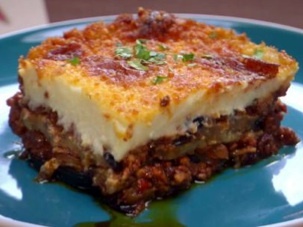 I will be ‘indulging’ in lots of turkey, a variety of vegetables and 1 slice of my special Greek dish, Moussaka! A side I will be making for 60 of my closest family and friends! I am so grateful for my beautiful customers from countries all over the world. The support and love I receive from them is worth continuously working hard to perfect my formulas to make them feel better about themselves, exude confidence and seize all the blessings life has to offer. I have been a single working mom for over 10 years. I have worked hard to ensure that my son would be a good person that loves God, and cares about the world and the people in it. So to watch him grow into this kind of man and more, is one of the greatest blessings in my life. From being at the top of his class in law school, to finding a wonderful woman to marry and make his partner in life, I know that his success is the combination of all my hard work, great friends and family, and of course, God. I am thankful for my assistant, Sara who keeps me organized so I can do my best. I thank God everyday for my health and using me as a vessel to create blessings in other peoples lives’. I am grateful for all my loyal friends that are there for me through both the good and turbulent friends. It’s easy to walk with a friend that is doing well, but when life knocks you down, very few friends will get in the trenches with you. Luckily, I have found my few friends that will jump into the trenches with me. Try the Moussaka…I promise the compliments will just keep coming! Return the lamb to the pan, add the grape juice, and cook, stirring occasionally, until almost completely evaporated, about 5 minutes. Add the tomato puree and currants and bring to a boil. Reduce the heat to medium-low and simmer until thickened, about 30 minutes. Stir in the parsley and oregano and season with salt and pepper and honey, if needed. Remove from the heat.